A creation of postwar mobility and affluence, the upscale motor hotel swept across North America during the 1950s and 60s. Motor hotels combined the auto-oriented convenience and informal ease of the suburban motel with the luxury amenities, attentive service and fine dining found in the better downtown hotels, all wrapped in a high-style architectural package that captured pure midcentury swank. 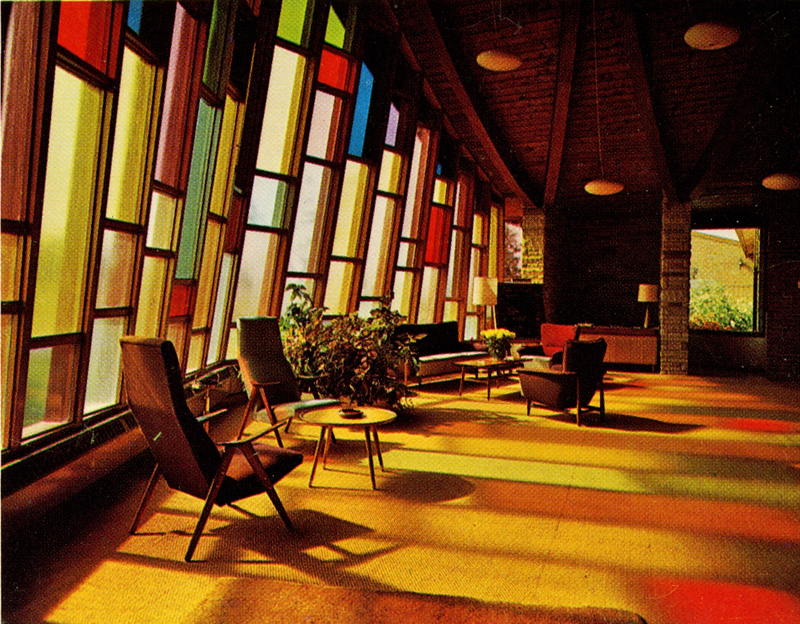 In Toronto, the model was epitomized by the sleek and glamourous Four Seasons Motor Hotel and the Inn on the Park, both designed by Peter Dickinson, and the Scandinavian-influenced Valhalla Inn by George Robb. 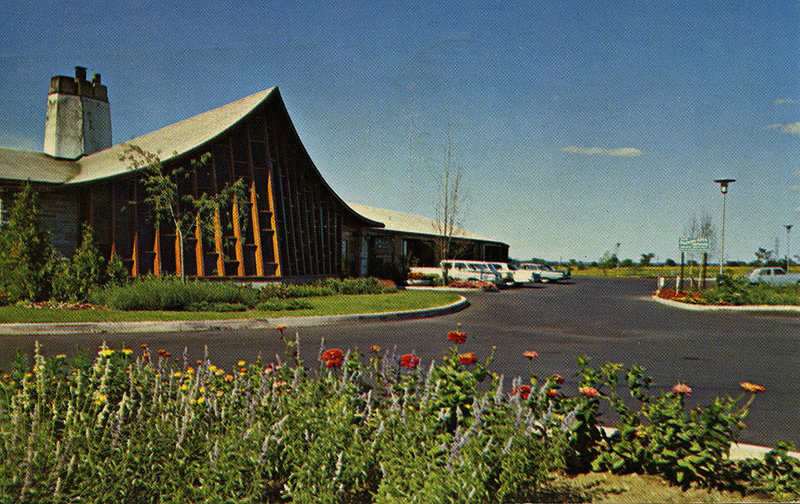 Joining the trend in the early 1960s were three other notable architect-designed motor hotels: the Constellation Hotel, the Ascot 27 Hotel and the Canadiana Motor Hotel. With air travel rapidly expanding and the new Toronto International Airport under construction, formerly rural Dixon Road became a magnet for hotel development. 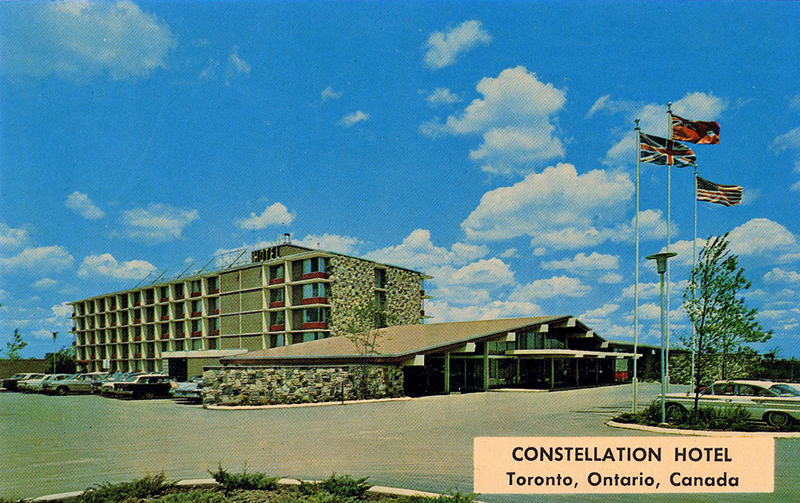 The Constellation Hotel (above and top) was among the first to open in 1963 at Dixon and Carlingview Drive. Architects Bregman + Hamann designed the Constellation as a two-part composition, fronting the block of guest rooms with a low-pitched A-frame pavilion for the entrance lobby and dining lounges. Rugged fieldstone walls helped to visually tie the pavilion to the site and contrasted its transparent glassiness. The Constellation’s backers further upped the ante by commissioning murals from Jack Reppen and Harold Town as well as Galaxy, an enormous welded-aluminum sculpture by Gerald Gladstone that now resides in front of the Etobicoke Civic Centre. 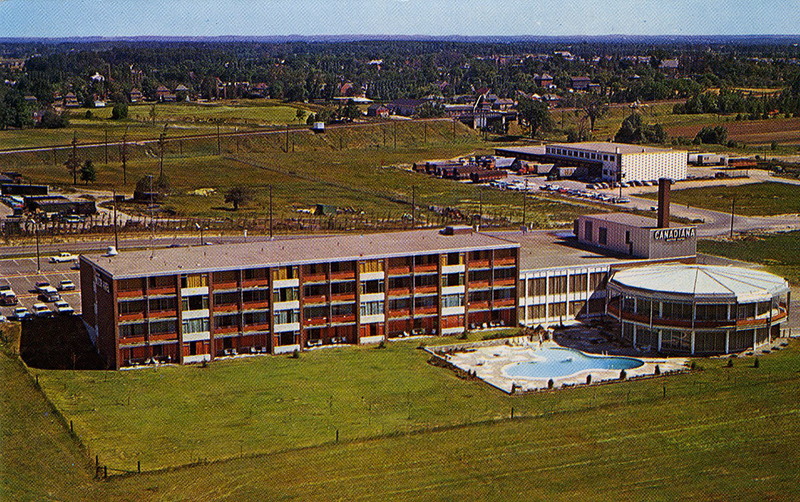 The Ascot 27 Hotel opened in 1960 near the intersection of Rexdale Boulevard and Highway 27, also convenient to the Toronto airport and the new Woodbine horse-racing track. Architect George Robb stretched the hotel 700 feet along a curving ravine escarpment, giving guests and restaurant diners a birds-eye view into the trees of the Humber River valley below. A swoopy Swiss chalet-style roof, inset with coloured glass, established an immediate visual identity and created dramatic interior spaces for the entrance lobby and dining lounge. 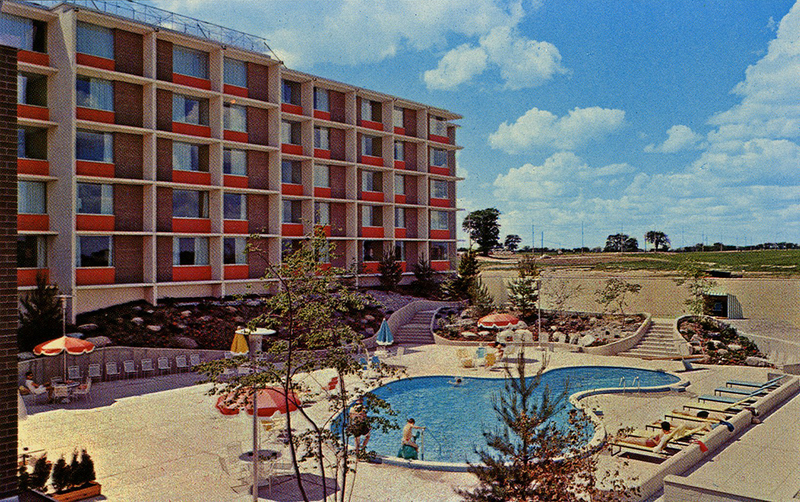 Overlooking Highway 401 at Kennedy Road was the Canadiana Motor Hotel, designed by James Murray and Henry Fliess and opened in 1962. Here, the signature element was the circular dining pavilion, a space-age flying saucer that had alighted on the lawn next to the amoeba-shaped swimming pool. The crisply rectilinear main building provided an inset sundeck for each of the 95 rooms as well as lounge and conference facilities. Like most of their contemporaries, much has changed for these roadside icons in the intervening fifty years. The Constellation Hotel was repeatedly expanded, enveloping the original building and enlarging from 150 rooms to 800 rooms (including numerous disco-era clubs, restaurants, health spas and palm-tree atriums) before going bankrupt in the early 2000s. The abandoned complex was finally demolished in 2012. The Ascot 27 Hotel is also long gone, replaced by high-rise residential towers, while the Canadiana’s guestroom block lives on within the current Delta Toronto East. The economics of the hospitality industry have shifted to blandly generic chain accommodations, but the remaining preserved or restored examples of classic motor hotels still bring a sense of style to the open roads.